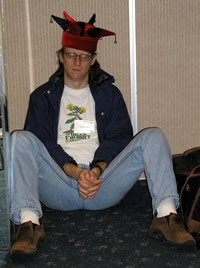 Wearing silly hats can be really tiring . Ah, Grasshopper! 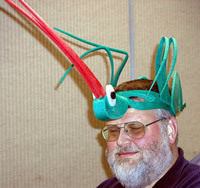 A hat for meditative coolness and matial arts. I can see this one going down well at an ice hockey game (though so far this season the Sharks have been particularly toothless). 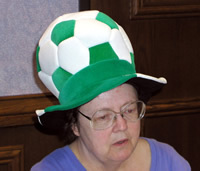 Judy insists that this is a Bucky Dome hat, and nothing to do with soccer. Celtic supporters everywhere beg to disagree. 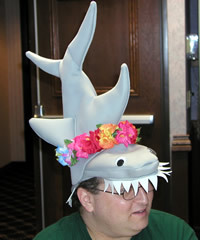 Greg Bear - the Guest of Honor gets into the spirit . Bear headwear - yes, this really is a hat.